● Pose with your favorite celebrity lookalikes including Leonardo DiCaprio, Taylor Swift, tennis star Serena Williams and others! ● Explore San Francisco Bay’s diverse marine ecosystem and aquatic wildlife at Aquarium of the Bay. Step into the star-studded world of Madame Tussauds Wax Museum San Francisco, located right on Fisherman’s Wharf. Walk the red carpet and get pictures with all your favorite stars – no ropes, no barriers! Pose with A-list stars, renowned musicians, sports legends, world leaders, entrepreneurs, superheroes and more. Share the stage with Adele, play the guitar with Jimi Hendrix and even sit at the replica of the Resolute desk in the Oval Office! Your pass also includes general admission to Aquarium of the Bay which is located on Pier 39, next to Fisherman’s Wharf – so head right over! 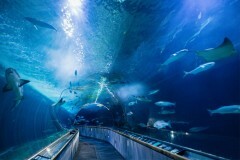 The Marine Nature Center at the aquarium features 300 feet of crystal clear see-through tunnels holding 700,000 gallons of Bay water and is home to 20,000 marine animals indigenous to the area. Walk through the tunnels to get closeup views of over 50 species of sharks including leopard sharks and Pacific angel sharks, bat rays, jellyfish, eels, skates and other aquatic animals. The Aquarium is divided into three main exhibits – Discover the Bay, Under the Bay and Touch the bay – which allow visitors to delve into the diversity and richness of life beneath the surface of the waters! Extended hours in July and August – Check here for hours.